15 Family New Year resolutions we made! While we play alot indoors, I do hope to bring the kids out for sun, sand, breeze and nature. Not scorching sun though. Not yelling didn't work for me. Safe yelling simply means controlled anger with no nasty or spiteful words blurt out. More deep breaths! The man usually eats home last because of his work schedule. I hope we can eat together more often. We have quite a fair bit of board and card games home, while I usually celebrate my victory for being able to avoid yet another game, I think we should get serious about setting time for family games. Jazz started reading fluently at 3 under my wings. She became my benchmark and I hope to get little brother embark fluently on it too. Yes, I know every child is different. It doesn't hurt making a resolution, I guess. Our book collection is spilling out of the shelves. We need to start borrowing instead of buying. Which brings me to the next point. While Js are going to school soon, it means more financial outlay. I need to stop shopping, yes, I'm proclaiming it. Stop buying toys because their collection is crazy! Being prudent is a great virtue after all. With no maid home and aging kids, I'm determined to get them more hands on in household chores. Every member plays a part in housekeeping. I'm glad they have quite a routine bed time, but there are still days I've to nudge them up in the morning. I aim for all mornings to be bright and chirpy with them rising on their own. While I'm very time focus when it comes to bedtime, I usually rush through it because we're overrunning it or because I desperately need my 'me time' soon. I guess, it doesn't hurt to read another book or say another prayer for them. The best gift I can give my kids. Like any couple, we do have occasional disagreements. We shall make it a point to hold back and resolve peacefully with no quarrels before those little eyes. While I focus on being a good Mum, I do want to keep focus on being a good wife too. 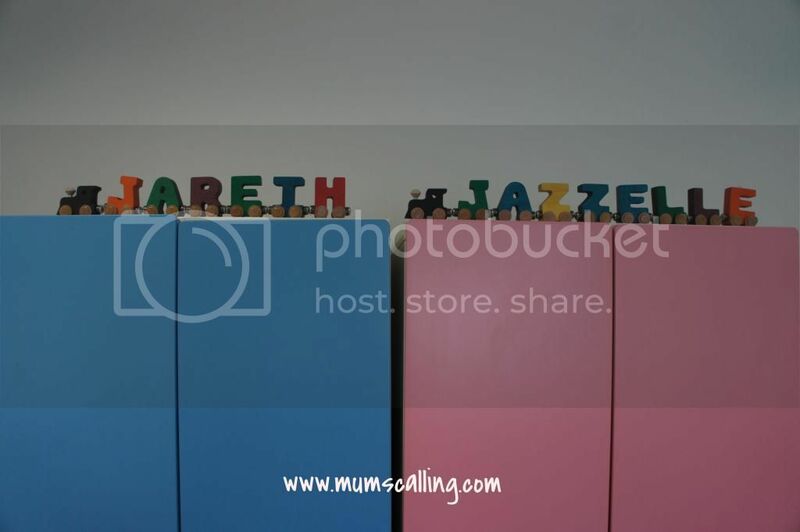 While it's Jazz final year of lullaby before she formally goes to a mainstream school, I hope she plays and make the best out of the year before she dons on the uniform for the many textbook years ahead. Yes, they are going to school, but that doesn't mean I'm washing hands off academics. I'm no heroine when it comes to homeschooling. I lose my patience and get frustrated when my layman explanation doesn't get into them. While I am really anxious about them getting it right, I need to be more cool headed. As their learning gets more complex, I do hope my patience heightens too. While I think we are birthed fortunate, I hope we can constantly seek out opportunities to help the unfortunates as a family. While we do have plans for family expansion, I do hope we make each child feel special before attention gets divided. I'm usually very family oriented about doing most things together as a family or to be fair, both children will have to be present. Oh well, I think we do need occasional private bonding for each child. Now I wonder how many of these can be checked off before another new year arrives. Actions speaks louder than words after all. Laying them down definitely serve us a good reminder! Cheers to a great year ahead. Natural and eco-friendly products are increasingly on the seek out among the health and environmentally conscious users. For the Mother in me, to the extend of hair care. It's nice to always place a little more attention to the shampoo our little ones use, especially according to their showering style, gets it washed down all over their face. 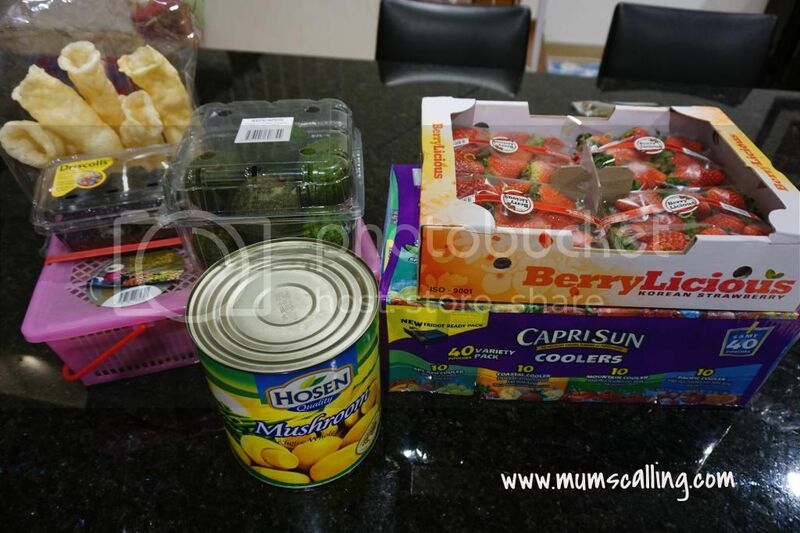 As much as I can, I prefer using the minimally and naturally processed products or food when it comes to kids. That goes to say I am always looking out for paraben and sulphate free shampoo and bodywash. I've recently came across eco.kid at pout, and fell in love with their good range of safe quality hair care products for kids. eco. kid is formulated for kids aged 3 to 12, and so it's able to address many problems by this age group including dry scalp, cradle cap, head lice, dry skin and skin irritation. It's free from nasty chemicals like silicones and sulphates. The best and closest I can get to nature. I specially like its light pleasing smell that isn't overly fragrant or fruity. So yeap, no artificial fragrances. And their hair feels well cleaned after shampooing! Prevent daily shampoo: Uses pure plant based foaming agents and a botanical complex of Australian essential oils to gently dry clean the hair and scalp. Nourish daily conditioner: Rich in wild harvested Amazon rainforest butter and oils blended with rice, mushroom, wheat and mustard based conditioning actives to create healthy, shiny and most importantly, tangle-free hair for the girls! And someone has learned to shower himself! eco.kid is certified organic and contain 100% raw material. Cheers to gentler and healthier products! Have a browse over at pout today. From today till 08 Feb 2015, you may use the following 15% discount code off all your eco.kid orders: mumcallspout. Which after the discount will be cheaper than buying them from retail stores. Delivery via Singpost non-registered mail is free with orders of at least $30. Orders of $60 or more will be sent by complimentary courier. And of course, don't leave without joining our giveaway! 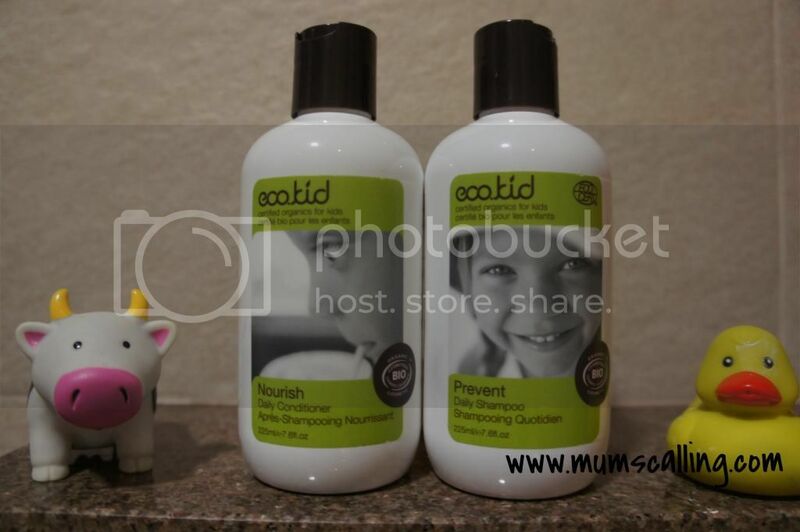 Heap thanks to the kind people at pout, a lovely set of eco.kid prevent shampoo and nourish conditioner worth $39 is up for grab. Simply complete the following 3 steps to qualify. 3. Like and leave your email address on this facebook post, tag a friend or more! Thank you everyone for your participation! A final keeper had been picked with random.org. Congrats Belinda L! 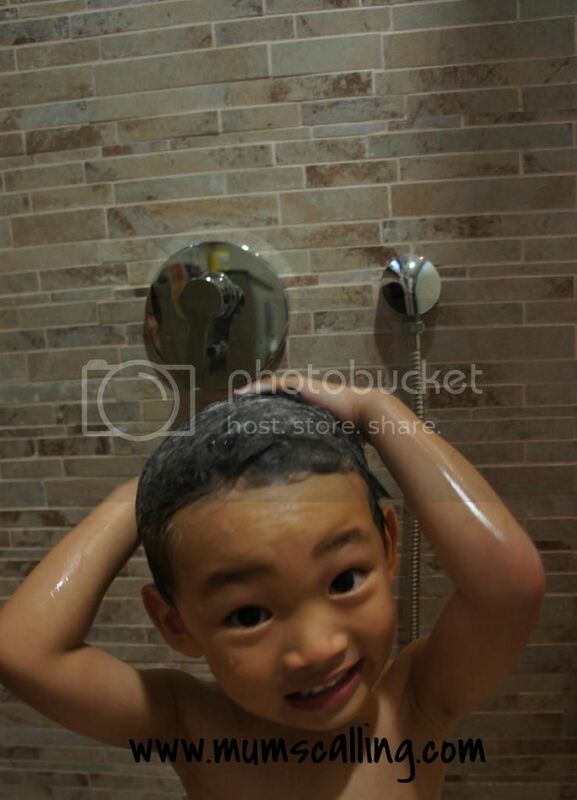 Disclaimer: We were given 2 sets of eco.kid shampoo and conditioner for the purpose of review and giveaway. All opinions and photos are solely our own. The World seemed to move more slowly when you've idling time. This was the kinda of motion I had when we were in the states. The kids were in school, no appointments, no rushed schedules and everything was too perfectly paced. It was then, that I found time to sink into hobbies. I learned how to make beautiful hair clips with ribbons! Oh yes, I'm thankful for my little princess, Jazz. She was my inspiration to venture into this hobby. 1. Use a lighter to anti-fray both ends of all the pieces. Alternatively, you may use an anti-fray glue. 2. Using the 11cm piece, squirt a little hot glue at the tip of the ribbon. wrap the clip from bottom up, squirting glue as you go and fold it inwards the pinch part of the clip. Contour around it to the top. Glue as you go along the top of the clip, then pinch open the clip to glue in the rest of the ribbon. Right picture below completes it. 4. Glue the 2 x 12cm to make circles. 5. Find the middle of the circle and glue it like an 8. As shown on bottom right picture. 6. Make an X with the 2 pieces made from step 5. Glue them together. 7. Use the 7cm knotted piece to bind over the X. The knot should be in the center of the X. Trim any excess ribbon and glue the ends behind. 8. Glue the completed bow onto the clip. This is how it looks from behind. Takes some time but gives much satisfaction! The big question is probably where to get the materials. I'm pretty sure Spotlight will carry what we need. If not, you may get the clips and ribbons on etsy, Amazon or taobao. It's always a thorough hunt for beautiful ribbons. The hot glue gun can be purchased cheaply from our popular bookstore. And here are 2 sets that I've made and would like to humbly giveaway to 2 readers. In hope they can be used as accessories for the upcoming CNY. Considering this is the work of an amateur, it may not be professionally done. It's the thought that counts eh? Tell me DIYs can be beautiful too! 2. Leave me a comment on this post, telling me which pair you would like to have, Blue or Pink. Do leave me your email address too. Giveaway ends on 26 Jan (Mon), 2359hrs. Simple steps! And of course, a big Thank you for participating a giveaway that's not even sponsored, but DIY-ed. Much appreciated! And the final keepers are Khor Lee Ling and Angie.S! Thank you everyone for playing, much appreciated! 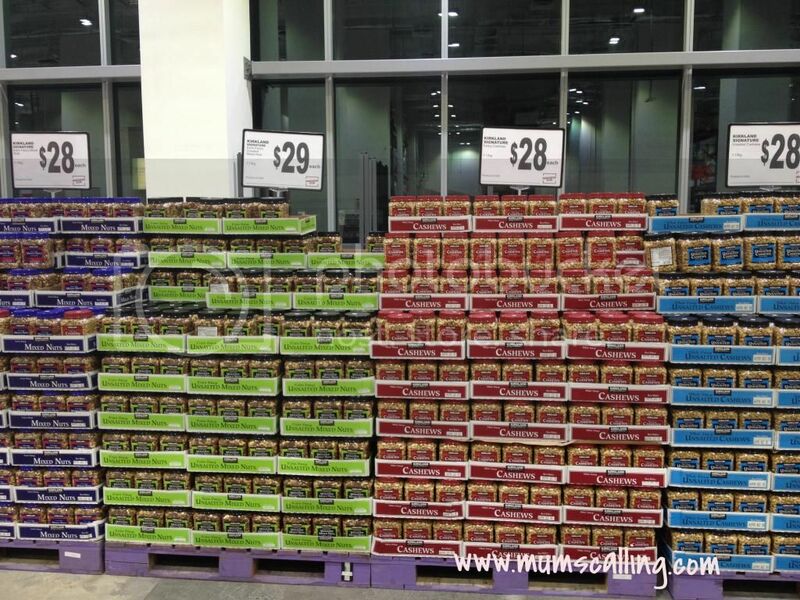 Is groceries in bulk for you? When we were in the states, one of my favourite place to hang out would be Costco (A place for the housewives). 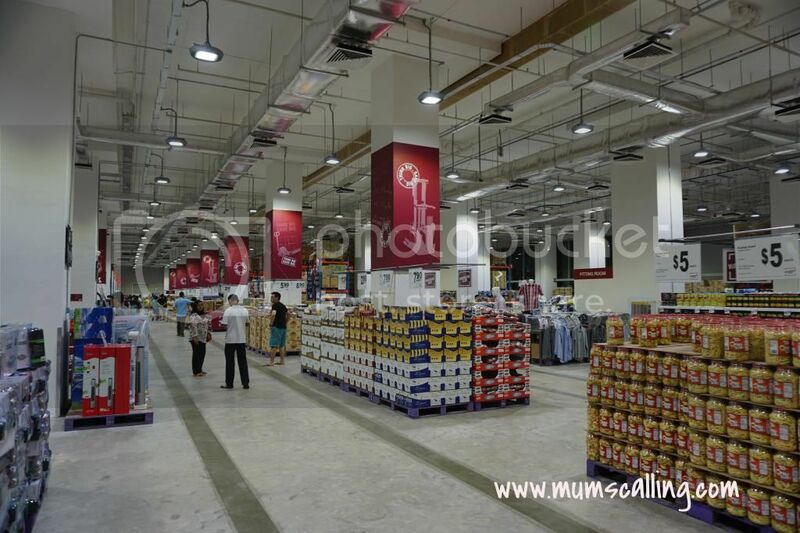 A huge store that wholesales a wide range of products from the perishable to non-perishable like appliances. You name it, they have it. When I saw that the Warehouse club opened its doors not too long ago, I got extremely excited on how the Asian concept will be like. I could feel its layout and sales strategy similar to that of Costco. Co-heading the food department at home, groceries shopping is very much my responsibility. I'm glad to have finally made a trip down to the wild wild west for a visit. Or rather a visit that got me into signing up for its membership. When you've huge and abundant space in the west, you've got space. Ample space. I love space when it comes to shopping with kids. 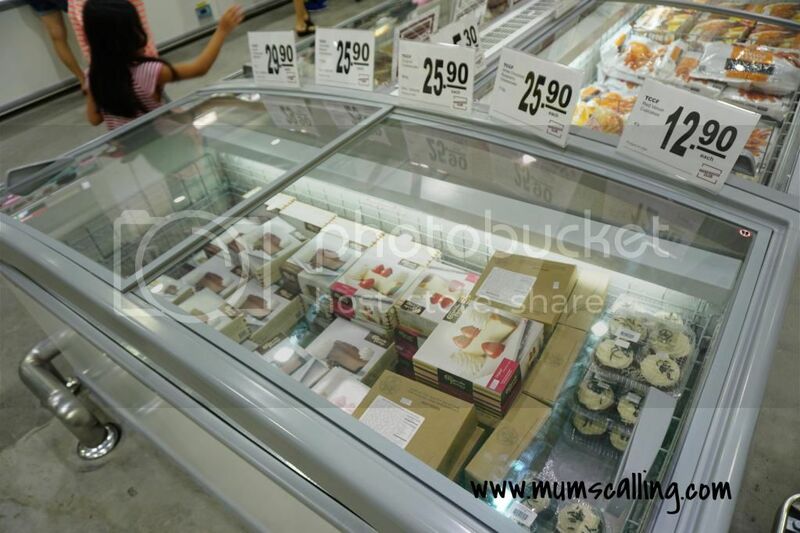 The aisles were wide enough to reduce the possibility of overcrowding trolley and human traffic. It's a nice place to roam in there even if we had nothing in mind. 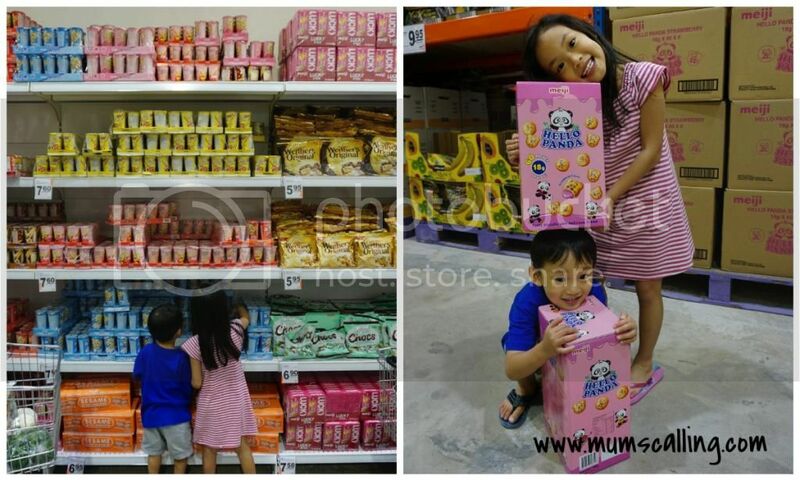 For being wholesale, most stuffs are sold in bulk or in really huge packaging. It's not what a family would simply need, but what a village of people could share. I would share the buys with the spouses when we were in the states. More economical with no wastage. Especially fruits that perish really quick. And while in there, we went 'wah' and 'wow'. 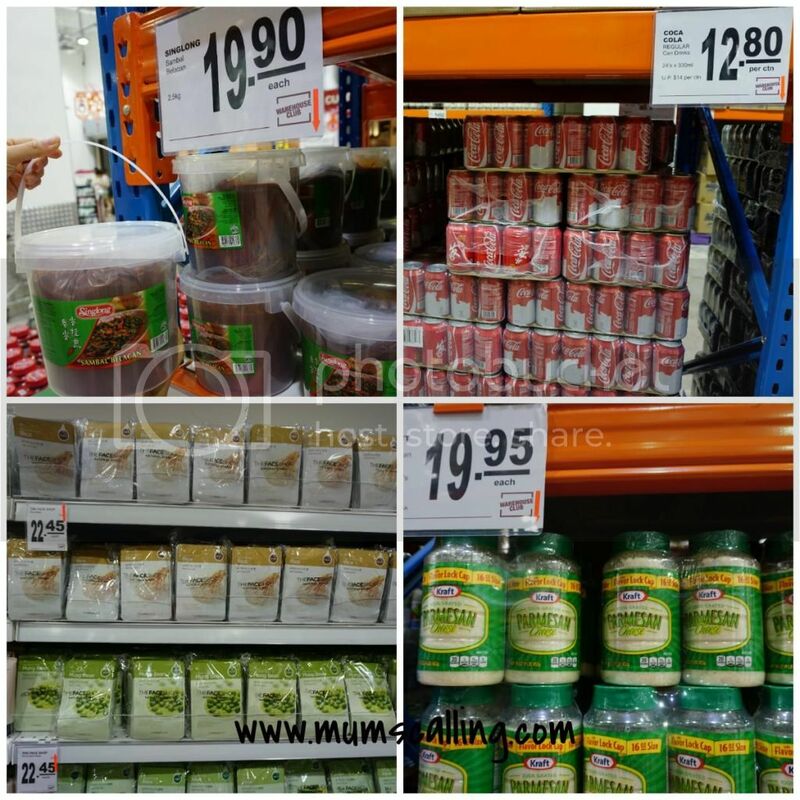 Out of the many, there was this shocking tub of sambal chilli ($19.90), 24 cans of coke ($12.80), Faceshop masks in packs of 15 ($22.45) and 2 huge bottles of Parmesan cheese ($19.95). 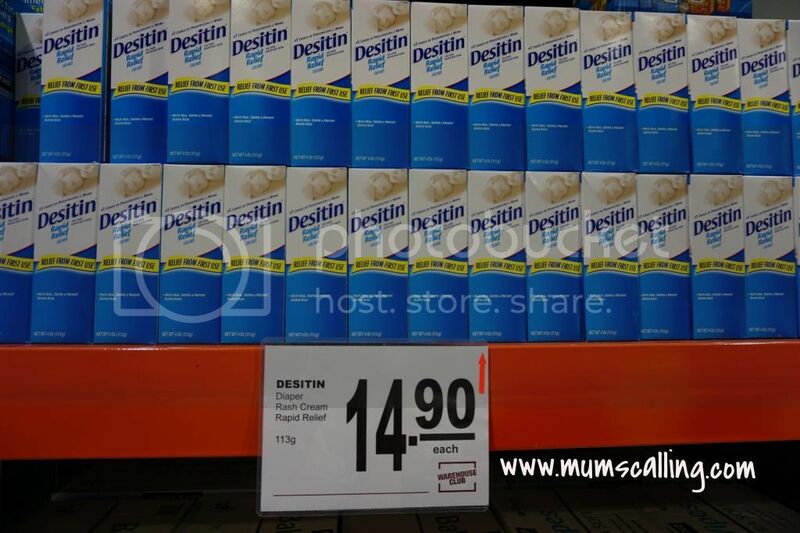 Would you buy in such bulk?!! I'll be interested on your usage if you do. The sambal and cheese I mean. For me, maybe the coke. I love coke! If you're a nut lover, this is for you! Variety of Kirkland nuts. A brand by Costco. It's imported, and so it might not be as cheap as getting a local brand. Depends on your taste preference though. My parents loved these nuts when they visited us in the states. The kids were excited to be carrying oversize food. They were just so gigantic! Though it may not be a good idea to stock these for personal consumption, it may be perfect for parties or goodie bags. For Mums, here's what might excite you. 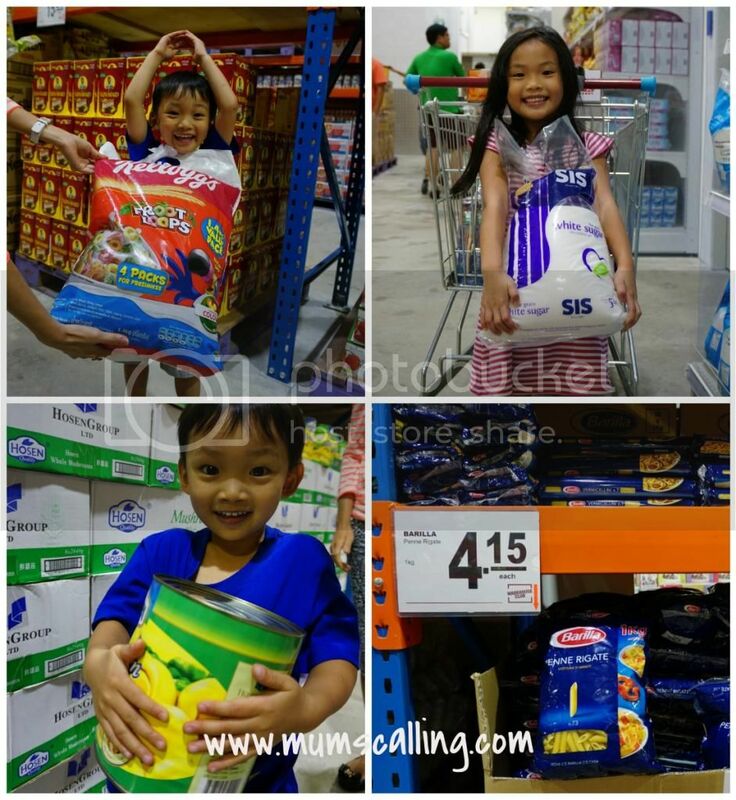 Quite a few brands of milk powder, just that they don't carry Similac, which Js used to be on. They sell diapers in bulk too! 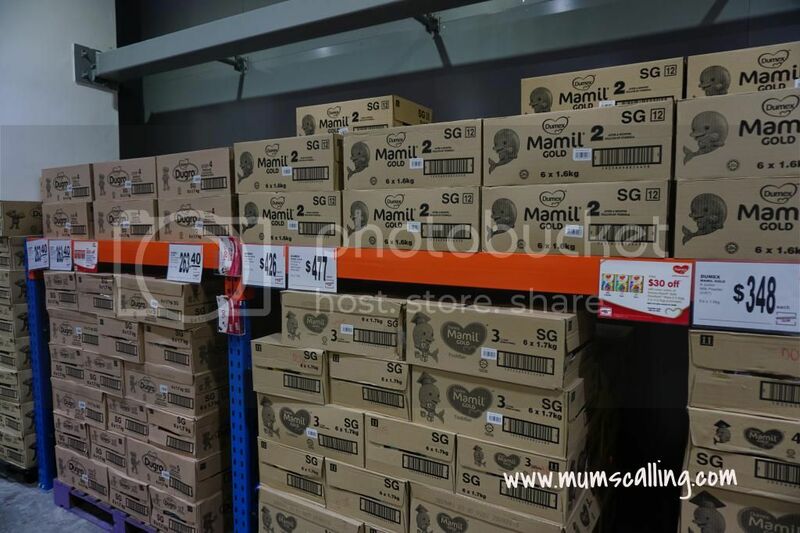 Then on level 3 were more snacks with perishable products like meat, fruits and frozen food. Fruits were stored in the chiller room which was really brrr... cold! You won't be able to stay too long in there to choose the prettiest box of fruits. Grab and go! Then re-examine it out of the chiller. Cheesecake factory lovers! This will be your section to stop by. I would love them, but having them here feels somehow different from having it fresh. Cheesecakes from the cheesecake factory! After roaming for about an hour in there, these were our buys! I've a village to feed indeed. Js are huge fans of strawberries and avocados, so we were certain about finishing them. And for that can of mushroom, I can only think of using it during Chinese New Year. Steamboat filled of button mushrooms! Done your Maths? The only terrible buy we had was the longan, which was beyond fresh and good. It's true that basket up fruits can't be fully trusted. I would say make a trip down only if you're on the way, or intend to get certain things in bulk. Not all brands in our regular stores were sold here. There were many other unfamiliar brands in there, which I thought more snacks or food should be opened up for tasting. I find it 'risky' to be buying some untasted food, especially in bulk. In the states, there were quite a few sampling stations and Js love their go on every food trial. Membership is at $50 per year for public or $35 per year for union members. Membership card must be presented upon checking out your items at the register. Though I think a lifetime membership would be more appealing. Which means, the savings must cover the membership fees plus more savings to make it worth. If only it wasn't this far from our home. Parking is free for the first 90minutes. We went 姑妈家 for dinner last week. Not my aunt, but 姑妈家 (gu ma jia). A restaurant! Though I wished I had an aunt with such awesome culinary skills. Everything in that name sounds too traditional and homely, which very much describe what we are. 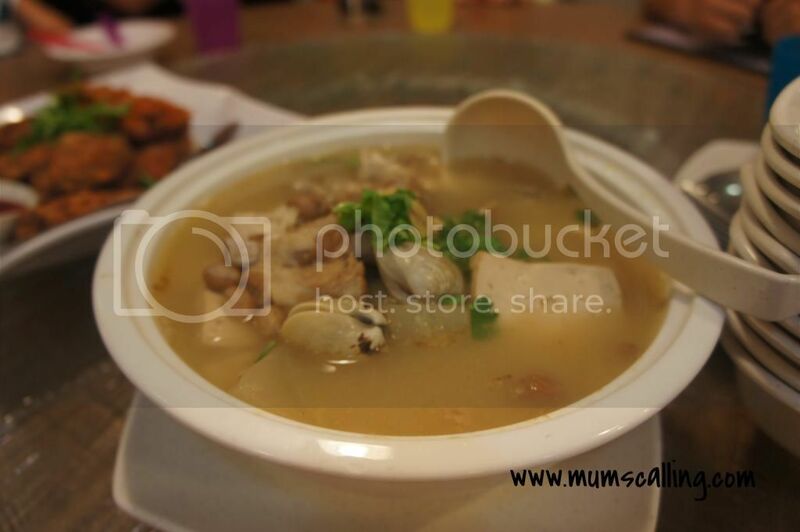 'Gu ma' serves near to authentic home-cooked food with less oil and less MSG. They celebrated their 5th anniversary this year and we were glad to be part of their joy, by being there to food taste some of their new dishes! 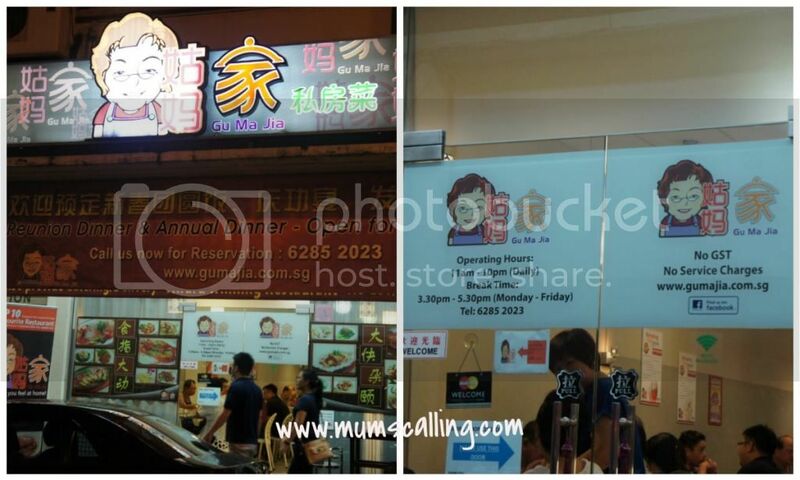 We were lovely greeted by the cute caricature of 'gu ma' on its signage. Which somehow gave me a feel that something really delish is cooking in there. Upon stepping in, I was convinced that everything's gonna taste yummy with its almost filled tables. It was a great weekday crowd. There are 2 levels in the restaurant. While waiting for the dishes to be served, I was given an enzyme drink to savour. Hmm, I've to say it wasn't to my liking till I hear of its benefits that very day. With fruits and vinegar going through the process of fermentation or aging, enzyme level increases. This final product boosts body immune system, promote healthy digestion, detoxify and revitalize the body cells. That was when I decided to slurp up everything in my glass. After a sourish enzyme drink, we were all ready for the dishes! First dish was their traditional bean curd soup. Power packed with wholesome goodness and boiled for 6 hours with salted fish head, ham, pork ribs, peanuts and fresh bean curd. Soup drinking is always a nice start to meals. We then had noodles! 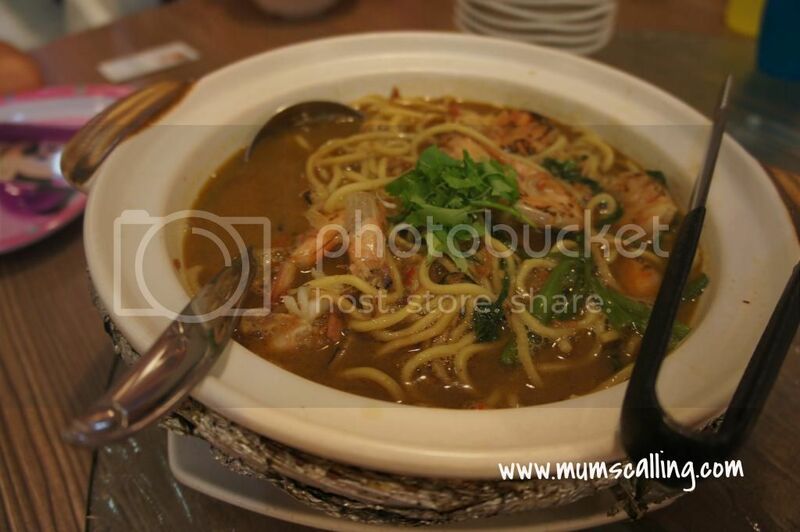 XO prawn noodles and ubin lala bee hoon. Only the freshest prawns were chosen for the prawn noodles and with XO, it totally complemented the sweetness of the prawn. It was spicy and Jazz could slurp up a bowl of it. She loved it! Ubin lala bee hoon is a replica of gu ma's childhood story in pulau ubin, where she grew up in. 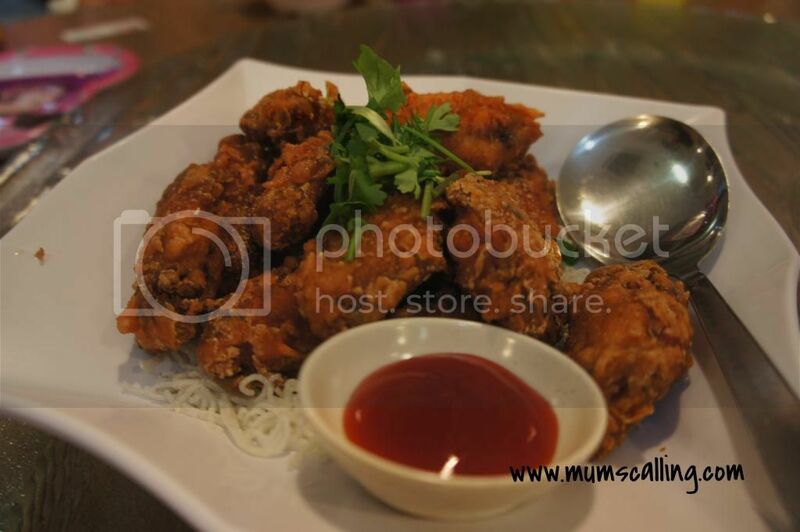 A simple and tasty dish that brought joy and satisfaction for everyone in her family. 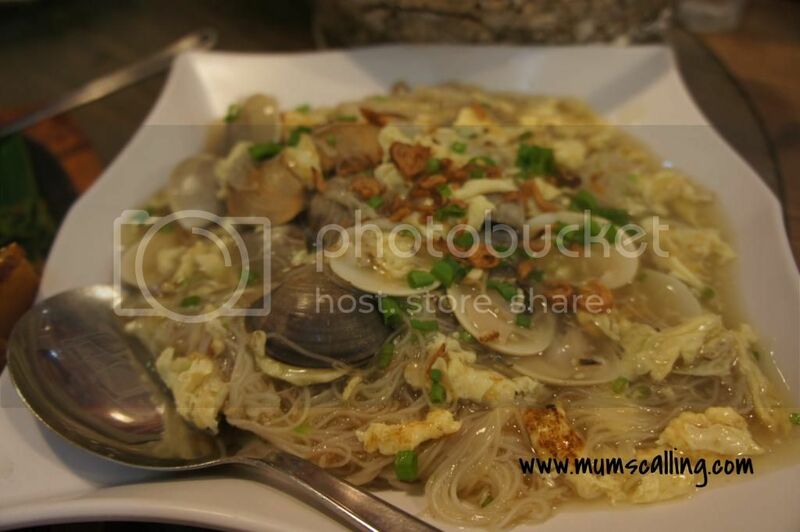 Vermicelli served with fresh lala was a refreshing try for us. A simple combination, but good tasting! I always love yam rings, and ta da, interestingly served with Kyoto pork ribs. All tender and good! 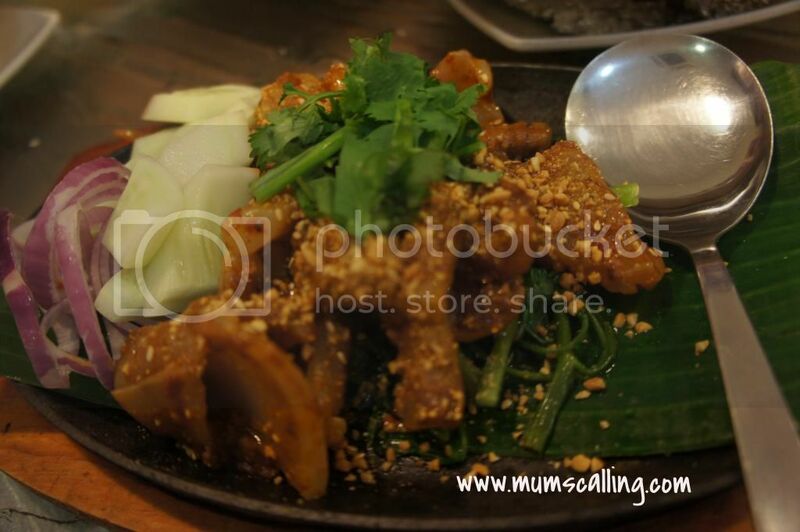 The yam ring, which was crispy on the outside and soft creamy on the inside, perfected the sweet and savoury pork ribs. We were almost all stuffed, and more dishes were on its way. We had the Satay cuttlefish, which I loved it very much, because the cuttlefish was all too soft and tender. Too kind on my molars. Then we were privileged to have a taste on its Chinese New Year dishes, Herbal chicken and lotus leaf rice. I was never a lotus leaf rice person, but amazingly fell in love with it. It was all too fragrant and good tasting! The best for the last, shrimp paste chicken. We love that it served only mid joint wings. Our family's favourite. What mattered was, the kids loved it and we had seconds to it. It was crispy and absolutely finger licking good! Of course, there's always room for the sweet, dessert! The always sweet way to end a meal. Jazz who's usually the least adventurous with food, gave the tang shui a try. She was never into Asian dessert, but gave a thumb up for this. She even requested a second bowl of it. It was a great meal, where over the table I met some other family bloggers too. In all, this made up a wonderful weekday evening for us. It was sumptuous, delicious and most significantly, all too homely. We were extremely well hosted and filled. 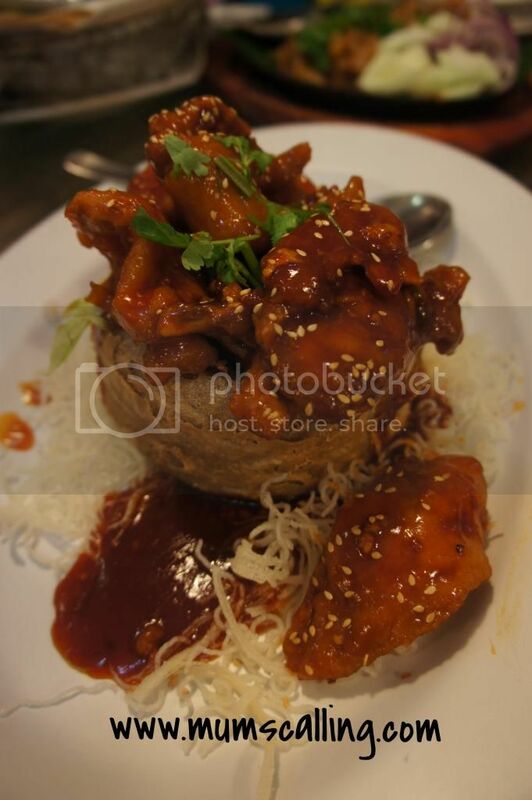 If you have not decided a venue for your reunion dinner, call gu ma for your reservation! CNY eve dinner is fully booked though. Reunion set menu are priced at $488, $588 and $888. Best part of dining here is, no service charge and no GST! Definitely a well-worth meal without hurting those pockets. Disclaimer: We were invited to this food tasting session by AT Marketing Consultancy. No monetary compensation was given. All opinions and photos are solely our own. Here's the second part of our adventure in Thailand, Bangkok. It's been a decade since I stepped foot there. Landscape is totally different in now. More sheltered walkways and shopping malls. You will not run out of malls or shopping markets to go. And perhaps it was December, it wasn't too searing. We booked our stay with Hansar. It was out of our usual travel budget, and definitely one of our most luxurious stay in a long long while. We made do with our friend who's strict with the hotel's gym, Mr Ang! 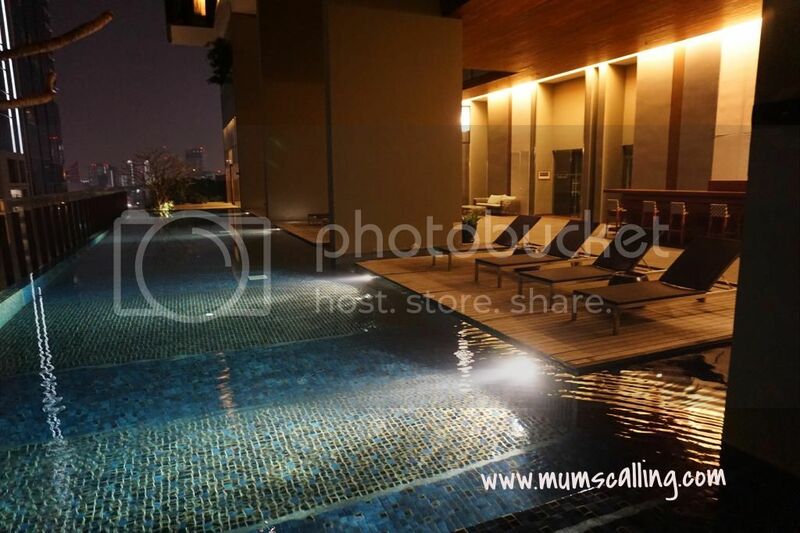 So fitness enthusiasts, gym and swim pool is perfect in there. Room's clean and comfortable too. Almost no complains till the day we checked out, when their staff questioned us on a missing bed runner. Which in the first place did not exist the first moment we stepped into the room. Picture was taken before meddling with the bed, so where's the bed runner? Our penalty for not tipping the housekeeper, I guess. Beautiful pool. No kids pool though. We booked the studio room which in addition came with a washing machine and mini kitchen with cooking facilities. Fridge and pantry were well stocked with drinks (beer inclusive) and snacks. All at no charge. Singaporeans love it, no? 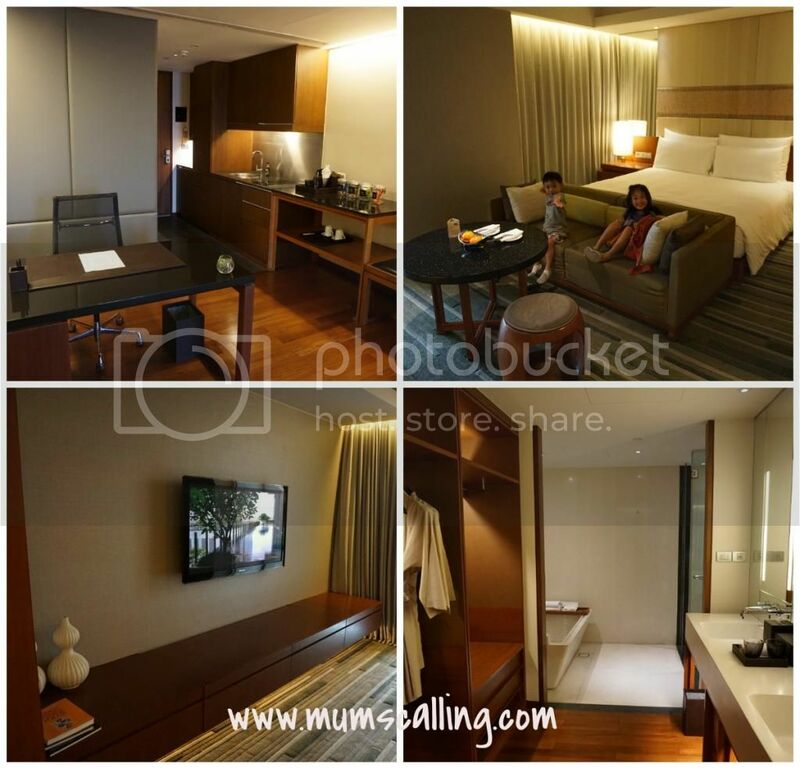 The hotel was a 5 mins walk to the nearest train station, Ratchadamri and one stop away from Siam (think orchard road). Love it for being opposite a decent and affordable massage centre, 270 baht for an hour of Thai or foot massage (about SGD12). Definitely the best place to end each long day. 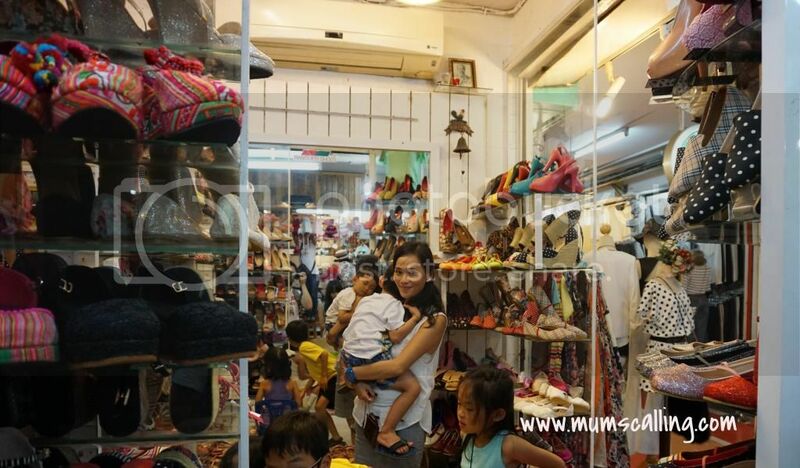 I love shopping for the cheap and affordable goods in platinum fashion mall, MBK, Chatuchak weekend market, street stalls in Siam square and the night market. Unfortunately, we ran out of days for MBK. Cheap stuffs are what we should go for in Bangkok, isn't it? Give grace on quality though. Such are the places where you put your bargaining skill to test. I even tested the 'give in or I'll walk off'' strategy. #BargainFail. They ain't gona chase you back to re-deal. Some nice ones would smile and some would give you the 'No big deal' look. So if you really love it, hook it at the best bargain. Some shops do not entertain bargains especially with prices stated upfront. It's not common to chance upon the same piece of clothing elsewhere. Shopping in their more luxurious mall like Siam Paragon or CentralWorld ain't really my cup of tea, because most brands can be found local at almost the same price. Economics taught me to pump money into my economy to keep jobs and growth sustainable. I'll buy them here if I want them. We enjoyed strolls and meals in there though. This is extremely touristy, but a very nice experience. About 2 hours drive from our hotel. You may take a taxi there or hire a driver from the hotel. We did the latter as we were a big group. The experience was pricey, appalled that it wiped out all the cash from our wallet. 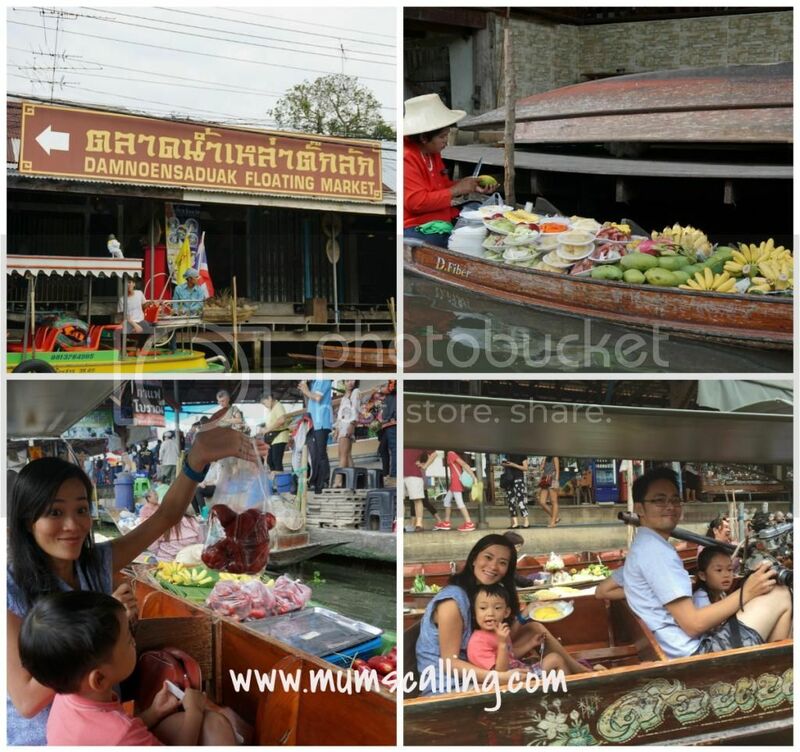 A 2 hours boat ride costs about SGD120 (3000 baht) per boat (fits 6 adults). So it wasn't exactly head counts for us, but per boat for our family. We tried to negotiate fitting 2 families in a boat, they weren't keen in earning a boat less. Then they will try to up sell the elephant ride, monkey show and crocodiles show within. If you think you're aiming for those, bring more cash. There's definitely a cheaper way to tour. Most taxi or drivers will bring you there, to a private tourist operation (which we ended at). Not directly to the market. 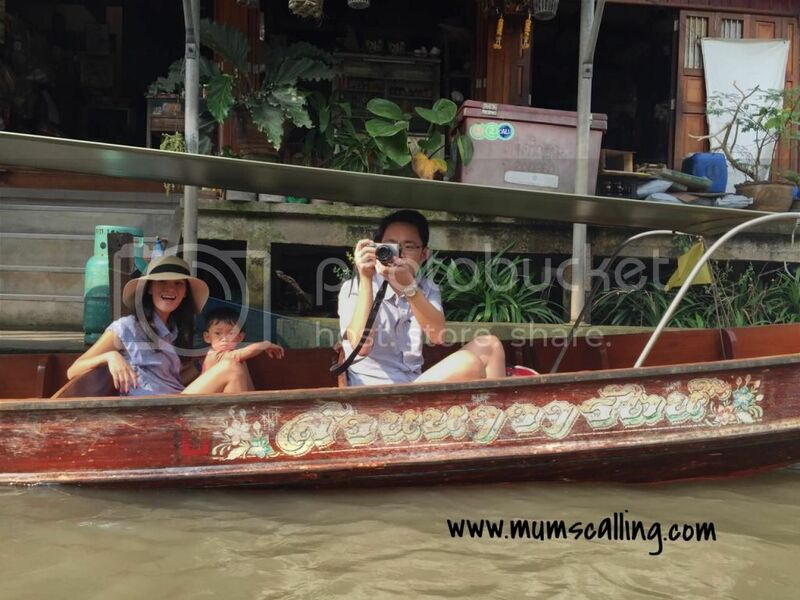 You can go directly to the market and get on local small row boats and this would be good at about 150 to 200 baht per pax. Getting your driver to take you directly to the market may be a challenge. You can choose to walk 1.5 to 2km (quoted from what I read) to the market if you didn't meet an angel. Bangkok used to be a city of canals. While most have made way for roads, there are still some preserved. 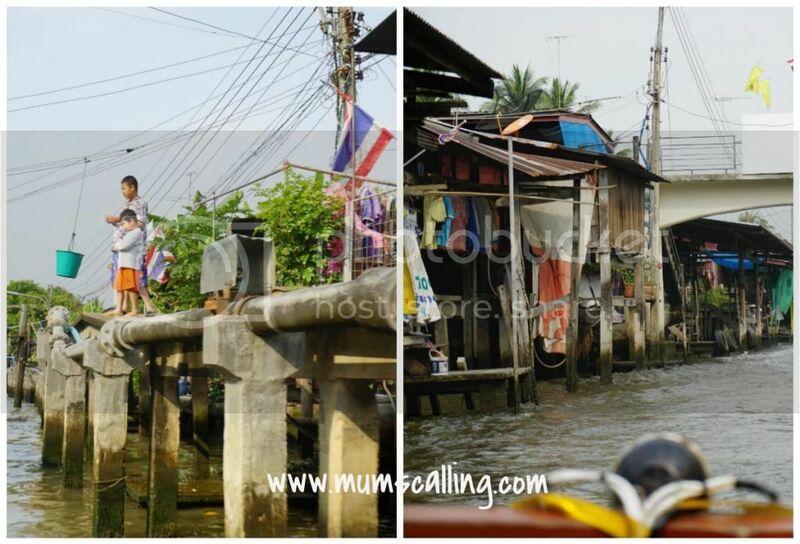 Interestingly, these canals handle the sewage of the city and houses floating markets with residents living on it like that of 'kelong' houses. It did feel really awful to have splashes of water on your face. Damnoen Saduak is the most popular floating market in Thailand, but I felt it didn't look as authentic as it would be to the Thais. Everything was skewed towards tourists. The things sold were what locals wouldn't buy, and they got similar as you row inwards. For a start, our boatman stopped at almost every stall by the bank, till we sounded him to move on. I reckoned things might be quoted cheaper as you move inward. Bargaining is definitely a must! Boldly go up to 80%! I didn't bargain on food though. 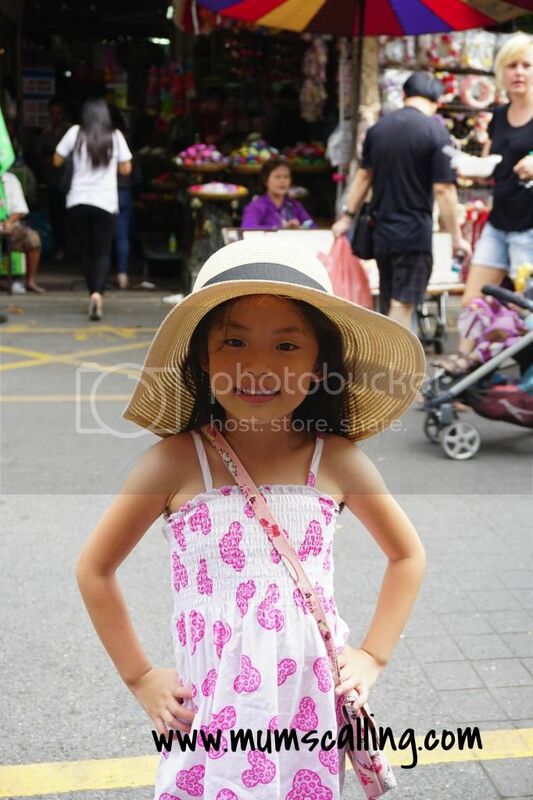 Other than visiting temples (which we skipped) and visiting a sugar coconut farm, it was a pity our tour did not include hopping off at the sheltered area in big market. I thought that would be interesting. I'm not sure if getting a boat ride from the market would bring you through the same water path as ours, going by the residential houses by the water sides. An eye-opener, I thought. The pail carries some trades across the canal. Think the boys were buying candies! Though it's as touristy as it sounds, you should however get your hands into buying something off the boat. That's what make up the big part of your experience, other than witnessing boat jam and water traffic. And if you're willing to leave your hotel at about 7am, you could even visit Maeklong railway market before the floating. 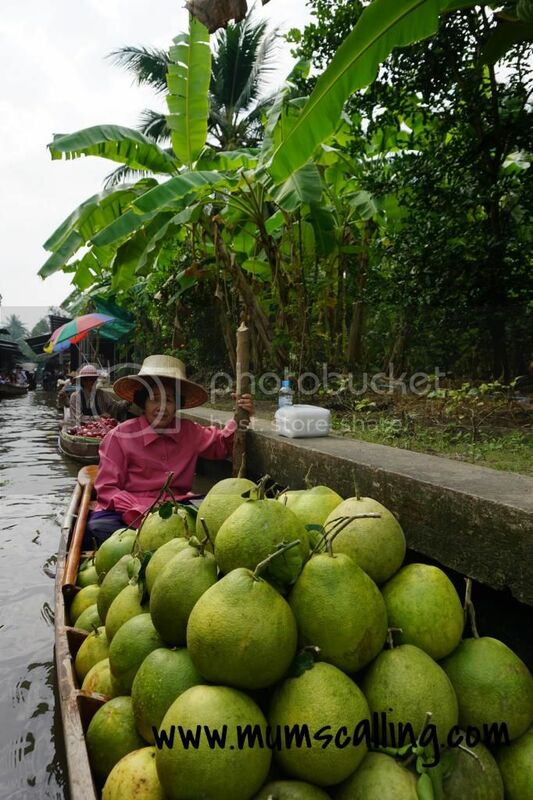 It's on route to the floating market. Place where an active railway runs through the market. Think marketers packing up hastily for train to go pass. 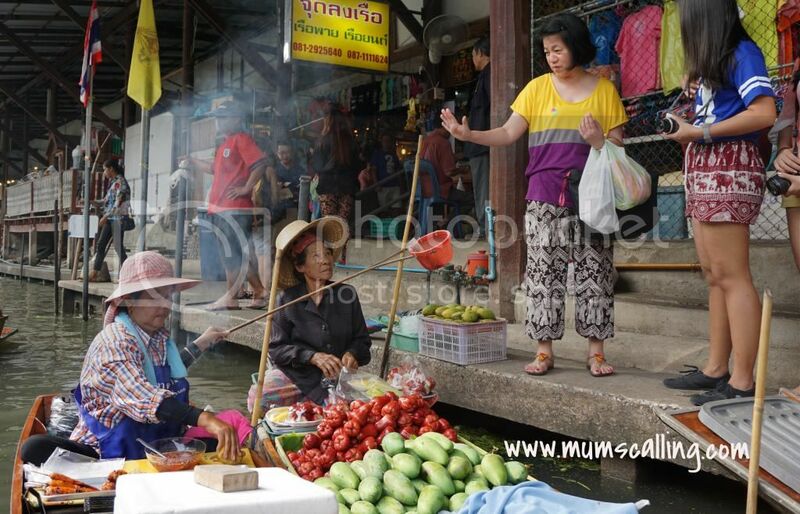 The floating market should however be witnessed in the morning where liveliness is displayed and before the sun greets over our head. It was an unusual experience for us. The kids enjoyed it very much! 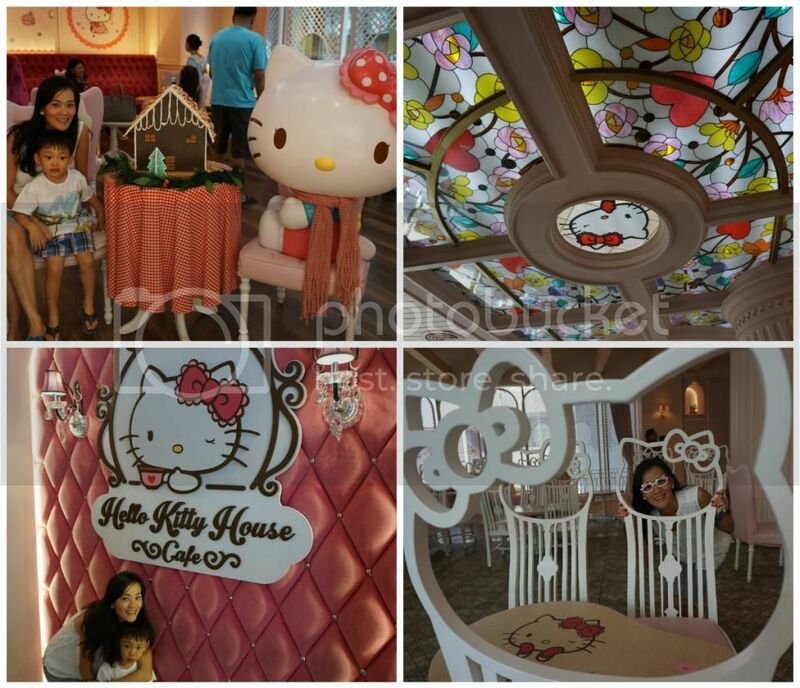 We aren't fans of hello kitty, but was very attracted to get in because there was no queue on the day we visited. A weekday morning we went. 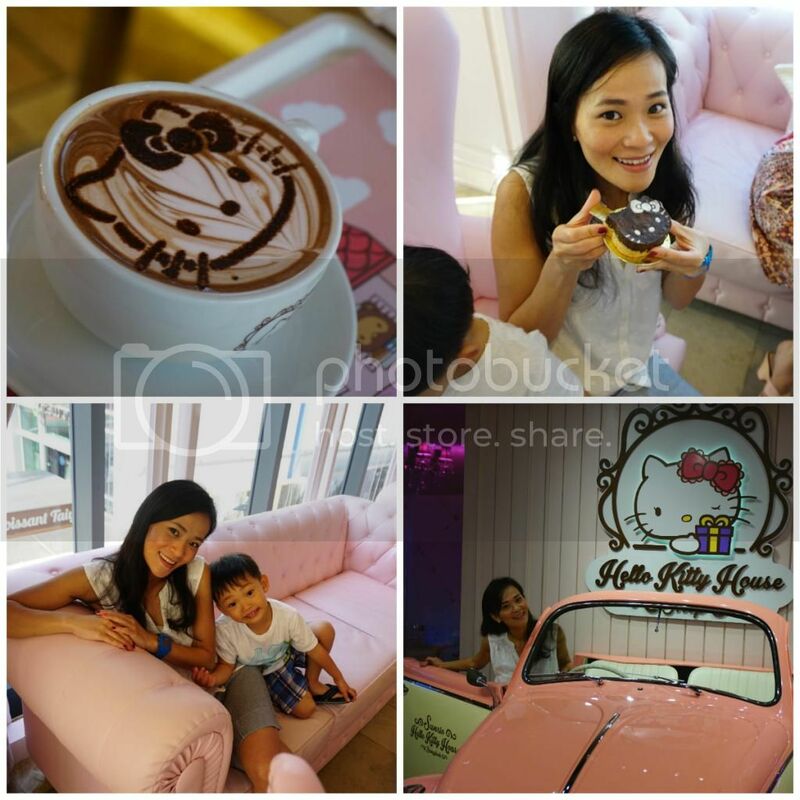 Love the pastel pink embellishments with Hello Kitty inspired pastries and beverages. Pretty food and place never fails to excite me. Though I think loyal fans will appreciate it more. Located in Siam paragon. Friends who had been in here would tell me it was a wonderful experience for themselves and kids. No doubt, the kids enjoyed it very much. But I've to attest the slight frustration I had with the crowd. It was seemingly overcrowded. I guess, due to the date we were there too. The kids were spending more time in lines than getting their involvement in play. It wasn't easy, especially for Jare, he had to stay in line and not sway in and out, or he'll risk losing his place. I really should not be whining about this when they, being the ones in line aren't whining a single bit about waiting too long. They are sure patient little ones. Prior entry, we were welcomed by a swelling crowd at the ticket booths, despite coming in on a weekday. Still, we were pretty sure about doing it and queued about an hour to get our tickets. Do check their website for entrance fees promotion, which changes from month to month. The kids had been talked about and were much anticipating this excitement. It was our final full day in Bangkok, and they had been literally following us to shop around. I thought they should have their moment of fun too. KidsZania is like a children city. Everything built to their size, like in the real world. They study, contribute and earn from the economy. No work, no money and less spending. No education, you earn lesser. There were many occupations they could get their hands on. They could work as a flight attendant, pilot, veterinarian, optician, pop star, mechanic, construction worker, police, fireman etc. It was really exciting and definitely more fruitful play if the crowd was better manage. But I can also empathize every child's disappointment if they couldn't get in due to crowd management. The first stop was to cash out money from the bank. It was really cute to see the kids entering and exiting the bank by themselves. It really was high time to let go the helicopter parenting in us. Love the independency trained in here! So yeap, older children might enjoy better. Don't lose that money, kids! As predicted, they didn't conquer many stations and couldn't earn enough Kidzos to get a souveneir from the department store. Minimum redemption at their department store was 100 kidzos. The kids had only 50 kidzos to begin with. Not all stations earn you money, at some, you play being patrons and you spend. While I understand Kidszania might wana introduce the reality of earning and working, it wasn't feasible that day. The kids had to combine their earnings to redeem something. This was also the toughest part during play, because they have not really started counting money. They were left to fend for themselves in the store, while parents observe, yell and cheer from outside. 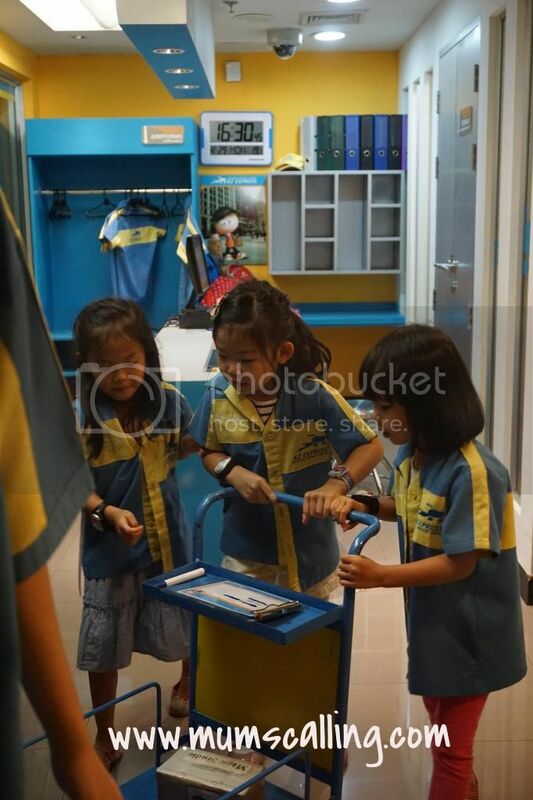 Thankful for shop assistants (kidzania's staff) who came to their rescue. Paid to get eyes tested. Became construction workers. Played vet. Became mechanics. They all looked too adorable to be starting 'work' this young. I hoped it had been experiential and fun for them. I knew Jazz had tremendous fun when she said, it was very x 5 fun! I'm happy when they're happy. Looking forward to welcome kidzania in Singapore soon. Rumour has it that it will open its doors in June 2015. If you've any kidzos left from other countries, I was told you could use it worldwide. No exchange rate risk. 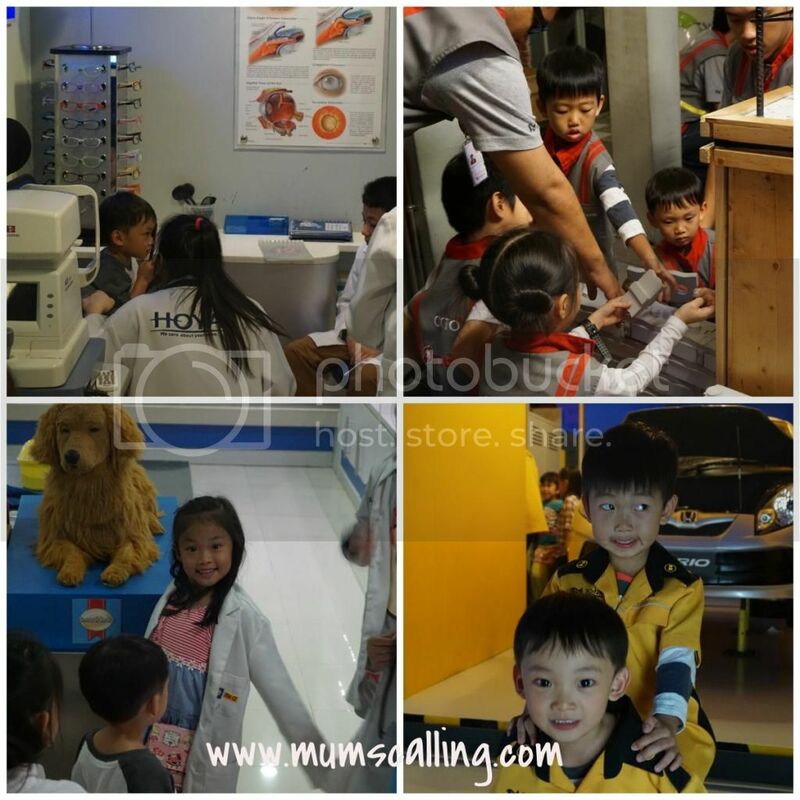 You may also read more on kidZania (Bangkok) review from lil blue bottle. She had a wonderful time in there with her girls. As the name spells, it's only opened over the weekends, 9am to 6pm. It was one I was contemplating to go, because my experience a decade ago got me really frustrated. I was kid-less then. This time, we gave it a go and spent a whopping 2 hours in there with a lunch break. I think I could survive longer, but Js were giving up on me. I could tell they were really tired and disliking it. It's a must go if you think you can handle the crowd and kids in there. I was glad we survived. The bottle neck where entrance and exit met, was really crowded. After entering deeper into the vendors, it was a little more breeze. I love it that these local vendors sell products from local factories. Always my target to go for local produce in the land we're in. They sell everything from home furnishing to clothes apparels. Clear bladder before making your way down. Toilet is a challenge in there. Several are around, but it's very crowded and grungy. Sharing our road trips experience - I brought a diaper for Jazz and disposable bottle for Jare. Jazz was dressed in a dress so I could slip up the diaper if her nature calls. Glad she didn't use it though. Jare was easy with the bottle. 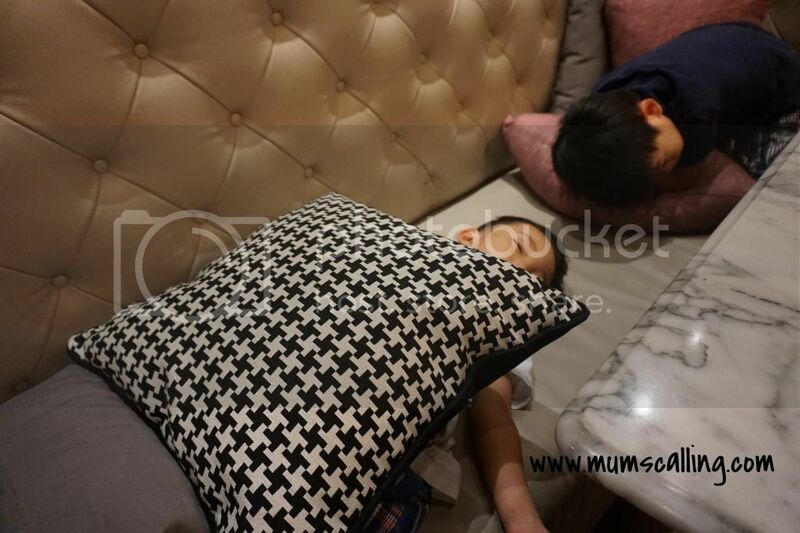 Judge me not, you'll be a desperate Mum in crowded situations like this. Of course, do your very best to find the most secluded corner for them. Try the food stalls there. They are soooo good! 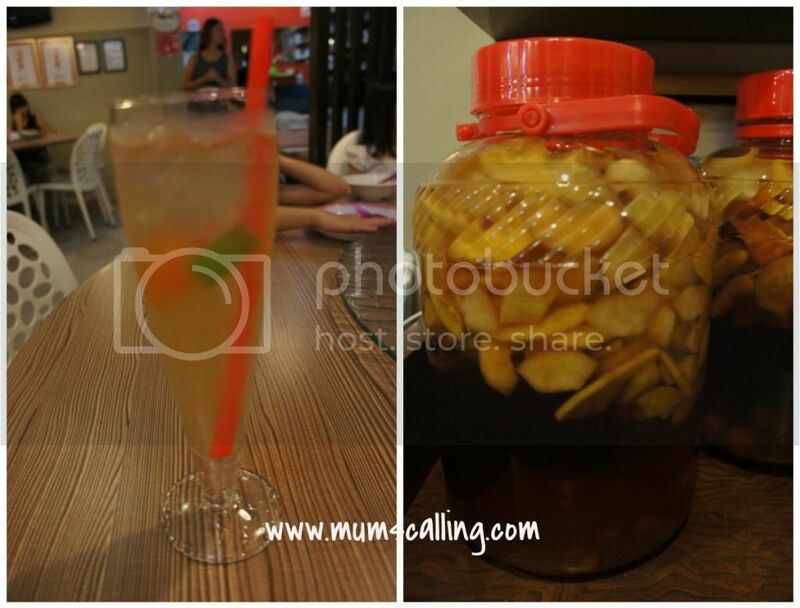 Thai ice tea is always more pleasing and fragrant at street stalls than at most restaurants. Must try! I'm so missing it now. Bargain really hard and buy! You ain't gonna find something similar along the way. 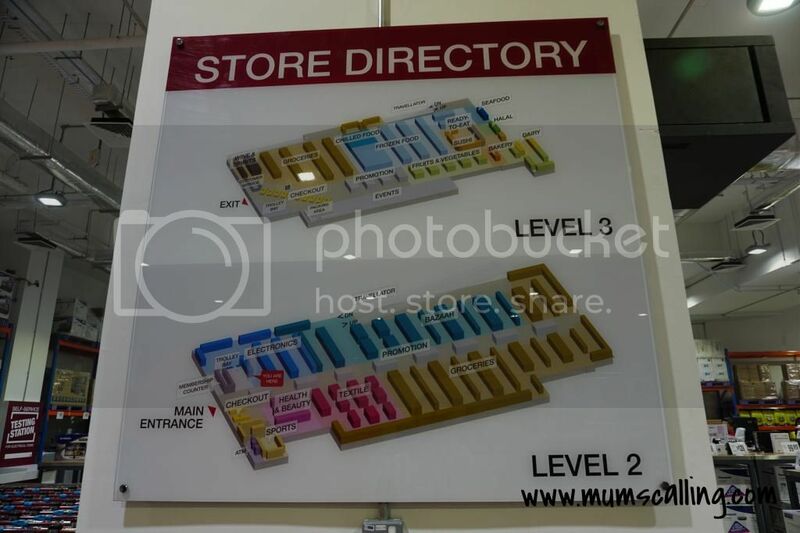 The place is enormous, you won't wana go back to the stall after walking away. Bribe the kids! 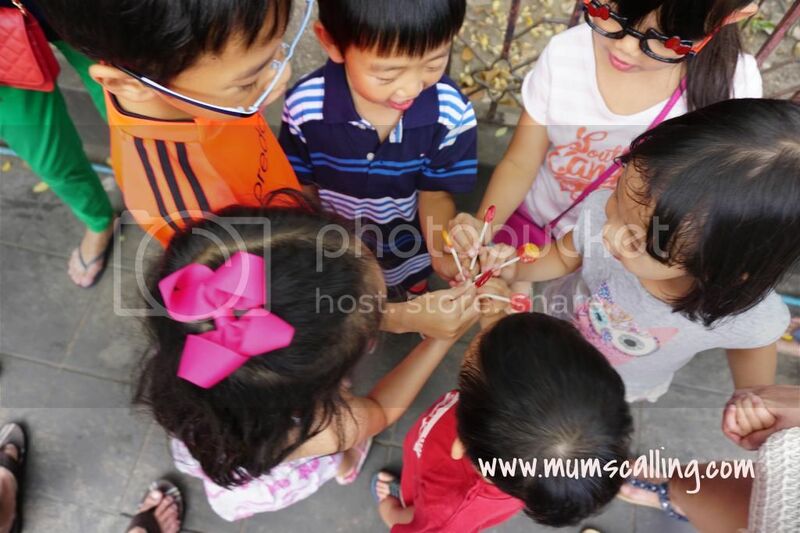 They were all geared up after doing their lollipop cheers. Just be careful of the crowd's nudges with those lollipop sticks. Ask if they would like something, a toy, a bag or how about a hat? It's fair eh, we're all on vacation. We can shop, they can shop! I heard most Thais work on Saturday morning, going early on Saturday might ease shopping a little. Security. Hold close to your belongings and kids, of course! It does sound like alot of massive shopping for me. But I'm rather thankful most ladies and kids' wears were not to my fashion liking. Age must be the culprit. Some savings there! Lastly, some good shares before my words finally stop flowing. 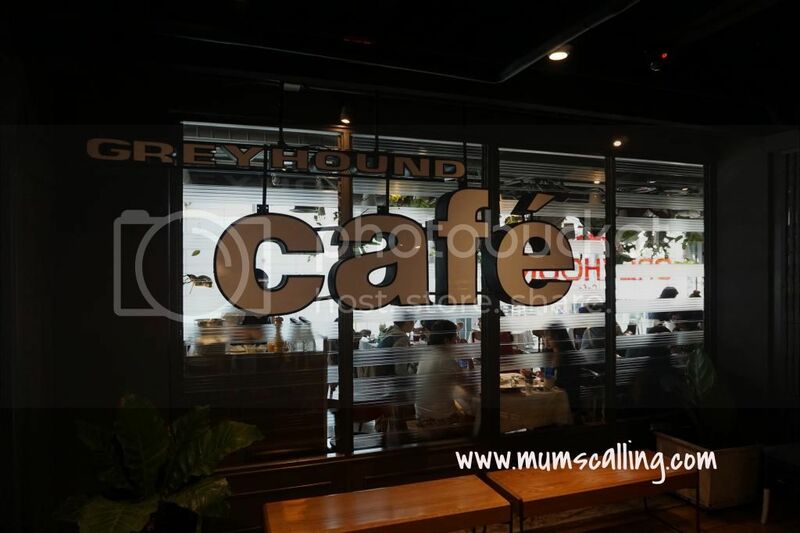 I need to share this yummy cafe we lunched in Siam Center, Greyhound cafe. Fusion food of western and Thai, all too good! Our friends had the complicated noodles and couldn't stop raving about it. I loved their Yum Thai steak salad. We had no feel of craving for any western delish in the land of smiles. Makes more sense to try their forte. And the tuktuk experience was one Js enjoyed much too. 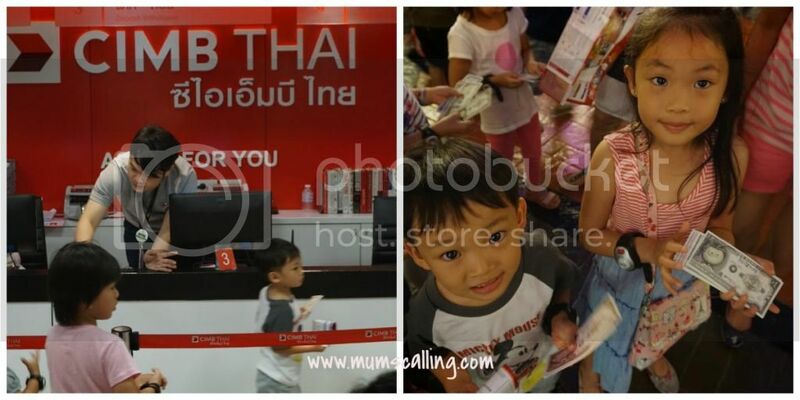 We took them twice, first time paying 150 baht and second time 80 baht. Both after some bargaining. There's usually more bargaining power if more tuktuks are gathered together. Competition and price are inversely related. If you're into caricature, which we've been waiting to do, you may head down to the night stalls just outside Palladium Mall which is slightly opposite Platinum Mall. 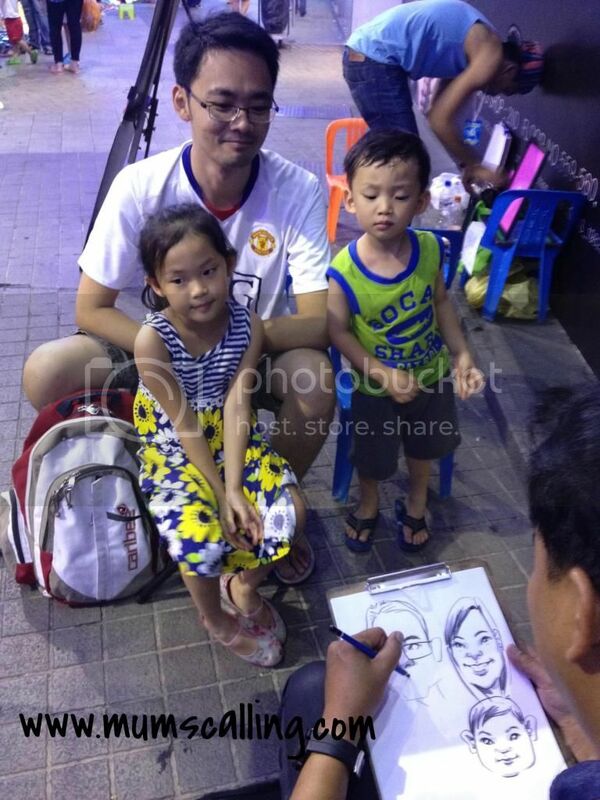 We paid 200 baht per face (about SGD8 per face). That's also where you can find customized casing like laptop covers, pouches or passport holders. Mine's done. So I'm up taking pics. That's big chunks of information and experience shared! Hope it's useful in a way or another. It had been a lovely time for us, bonding as a family and travelling with some of the world's best travellers, our friends, Angs and Lees. Special thanks to Mummy Ang for planning this wonderful trip! A vacation rejuvenates the soul, hope you had or will be having a great one too.